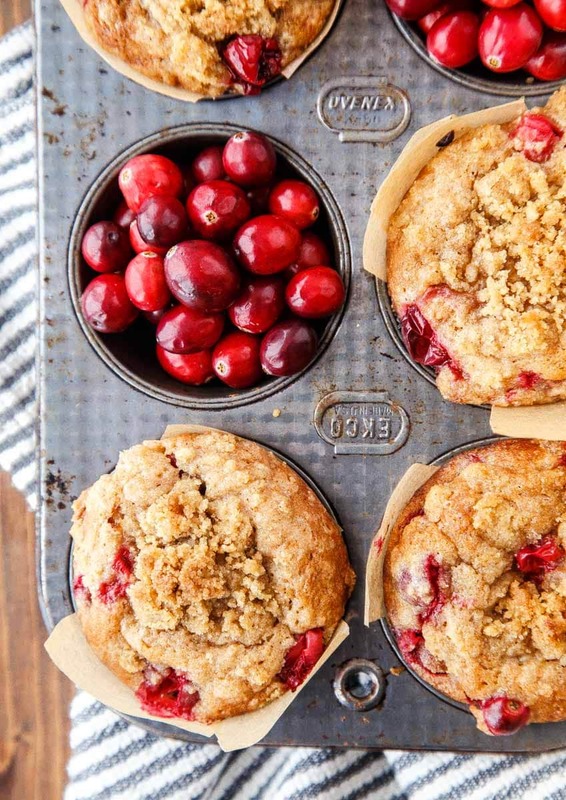 Sour Cream Coffee Cake muffins made with fresh cranberries. A small batch of sour cream coffee cake muffins is the best weekend breakfast I know! We’re heading into the last part of the year. The chilly part. The bake-all-day-to-keep-your-house-warm part. I love it. Each month, I make a list of foods I want to eat to set the mood for the month. Sometimes, the list has exact foods, like Chai Cookie Bars. Other times, I write a general feeling that I want my meals to have, like ‘hearty and comforting.’ And then, I often consider your lovely self, and what foods you would like to eat this month, too. For the month of December, I wrote: comfort food, cookies, and sweet breakfasts to share. Does that seem right to you? Are those the things you’d like to stuff in your face, too? While it’s a sunny 55-degrees where I live right now, I think we all need warm, cozy dinners, cookies for dessert, and something sweet to lure us out of bed in the mornings. (Sometimes the video jumps to the side of the page, so check there if you don’t see it). You can use fresh blueberries like I did in the video, or any other fresh berries you like here. I use blueberries in the summer and cranberries in the fall, naturally. We’re starting here with sweet breakfasts to share. 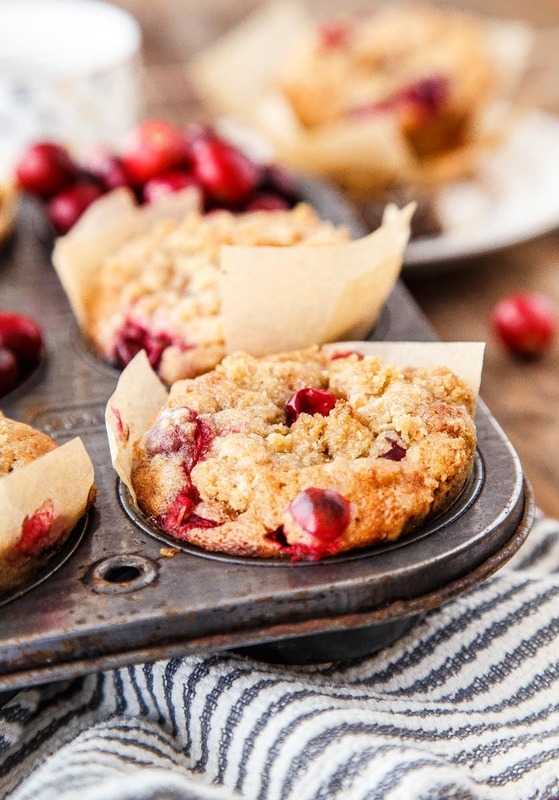 These cranberry streusel muffins made with sour cream were first on my list. A few years ago, I made rhubarb cinnamon muffins from a Fine Cooking Magazine, and my eyes were opened to how lovely tangy fruit pairs with warm cinnamon. I love sweet and sour rhubarb, but I loved it even more when it was sprinkled with cinnamon. While we are months away from my beloved rhubarb (and my revered Rhubarb Crisp), we have cranberries! 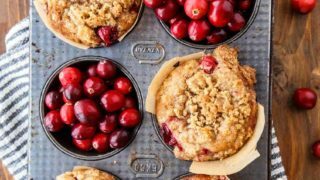 I stirred cranberries into my sour cream coffee cake muffin batter, amped up the streusel topping (or is it called crumb topping? ), and plopped it in muffin cups. The recipe makes 5 muffins. Two for me, two for you, and one for the dog, perhaps? That’s the way it goes in my house. The muffin pan I typically is vintage, and I love it because it only has 6 cups! But, if you’re lacking your grandmother’s vintage small muffin pan like me, here’s a great substitute! Also, you may substitute full-fat Greek yogurt for the sour cream, if you prefer. First, preheat the oven to 375, and line a small muffin pan with 5 liners. Next, make the streusel: in a small bowl, stir together all the ingredients with a fork. It will stick together and form large clumps. Set aside. Next, make the muffins: In a medium bowl, add the oil, sugar, and salt. Stir together very well, and then add the egg, sour cream, and vanilla extract. Stir to combine. In a separate small bowl, whisk together the cinnamon, nutmeg, flour, baking powder and baking soda. Add this to the wet ingredients and stir to combine. Finally, stir in the cranberries. Scoop out enough batter to fill the muffin cups half way. Add a generous tablespoon of streusel topping on top. Then, top with the remaining batter. Sprinkle the rest of the streusel mixture on top of the muffins. Bake for 19-22 minutes, until a toothpick inserted comes out clean with moist crumbs. Let cool in the pan for a few minutes before serving. Cranberries are my absolute favorite fruit. I love, love, love them. I am going to the kitchen right now to make these. What a great way to start the day. Love these! If my cranberries are frozen, should I defrost them first? Beautiful muffins! I’ve been on a serious cranberry kick this year and i’ve been freezing so many that it’s not going to end any time soon! Comforting, sweet breakfasts. All the yes!! It’s like a cozy hug in the morning. Love the pretty red berries in these — so festive!! Is it sad though, that the thing that caught my eye the most was the beautiful pan that you baked these in? *goes off to hunt for the brand Ovenex? Or is it Ecko? Oh I would love these! Yummy! This recipe looks perfectly dreamy! I don’t believe I’m going to wait for next month to roll around to make it, even if it is on your list for the next months eating pleasure! yAy, YaY, YAY, Christina Lane, you are my doppelgänger! Except for the 32 years that separates us! (Give or take 2) I LOVE a great list, yet this is one that even I have yet to conjure up in all of my list making years! I’m starting today!…with these wonderful muffins! Yes sir-eee! These are shooting right to the top of my list! Because I don’t have a list for ‘things I want to eat next next month’ yet, remember? See how fun that sounds just saying it? I’m tickled just saying it! My whole life of raising 4 children depended on carefully organizing them by balancing orchestrated lists of menus, shopping, pedritician and allergist visits..who could eat what, (lots of food allergies before it was a ‘thing’), even bath times and house cleanin were lists. Because I felt insecure about where my day was heading without several good lists! I love to cook, yes I do! But I super-duper LOVE to bake. And eat what Comes out of my oven. Hence the need for your small bakes! Keeps me out of trouble… Almost. My husband does his part to help with that me with that part too. Muffins! Making them, it’s on my list! Your photography is wonderful, but not trickery! The recipes always stand up to the photos you tempt us with. Thank-you so much! Such muffins would be so perfect with coffee! I love cranberry desserts! I can’t get enough cranberries this time of year! I would love to wake up to a couple of these muffins! 5 muffins! Thanks for not adding to my freezer with endless muffins. I love coffeecake anything, so I am looking forward to trying these! Can you please just come to my house and bake me a million batches of these. K, thanks! Seriously though, I am afraid to make these because I will make multiple batches and for sure eat them all! Love coffee cake anything! These looks delicious! A quick question, what do you prefer or use most often. The sour cream or full fat plain yogurt? Can I use sundried cranberries? Looks yummy, Christina! Are these the normal cupcake liner size or larger? What about using dried cranberries? What ratio should we use? 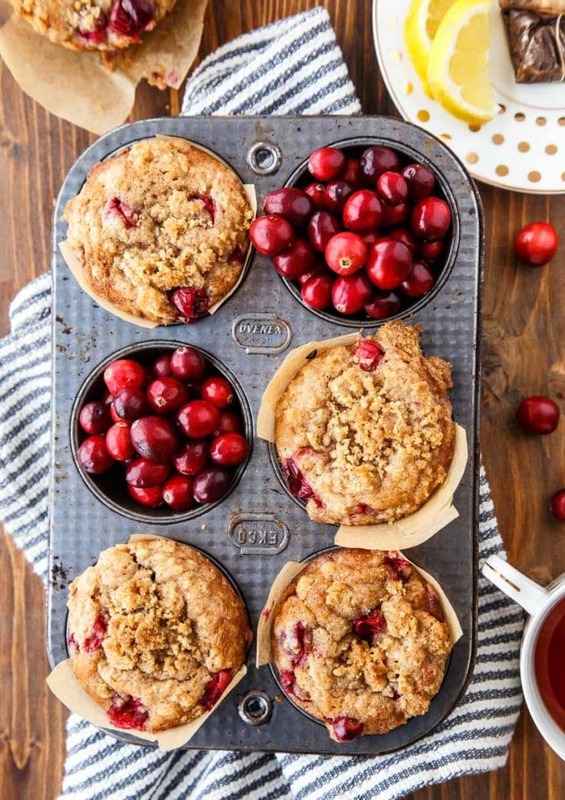 Hi… These muffins sound delicious! I’m interested in making full size and mini loafs. Do you have any suggestions for alterations to the muffin recipe? Thanks! I’m sorry, Ruth, I don’t do larger recipes. Small-Batch and mini desserts are my whole brand. Great recipe! Rivals to be my best muffin recipe this year! I usually make weekly muffin batches of 24 for my family to grab for breakfast all week so I multipled the recipe by 4 to make 20. Could have stretched to 22 as they ran over a bit. I’ll likely reduce some of the crumb topping and replace some of the oil with apple sauce to lighten it up a bit but these were awesome! Thanks for sharing. I am going to try this recipe, as I ADORE cranberry anything!! One question, in your picture presentation, what is the paper coming from around your muffins? That doesnt look like a muffin paper. Thanks in advance! These look so good! Will it ruin them if I use vegetable oil, though? Definitely won’t ruin them, Becky! They just won’t have the buttery taste, you know? let me know how it goes! These came out delicious! THanks so much!! !